Daniel Suarez and his No. 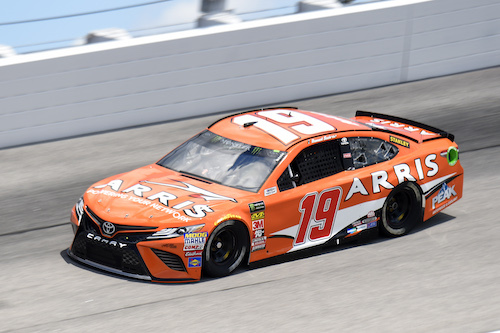 19 Joe Gibbs Racing team in the Monster Energy NASCAR Cup Series have been docked 10 driver and owner points, respectively, according the the weekly NASCAR penalty report issued Wednesday. The points penalties are the results of the No. 19 car failing inspection four times at Indianapolis Motor Speedway on Saturday, ahead of Monday’s rain-delayed Big Machine Vodka 400 at The Brickyard. Suarez also started the Brickyard 400 in the back and car chief Todd Brewer was ejected from IMS. Reigning Cup Series champion Martin Truex Jr. and his No. 78 Furniture Row Racing team also started in the back at Indianapolis and had their car chief ejected after three inspection failures. Suarez finished 18th in the Brickyard 400, the final race of the 2018 regular season. The NASCAR Xfinity Series also raced at Indy on Monday, but no penalties were issued after that race.